I did not, as originally planned, publish the final post in the Saturn Returns series. The lofty goal had been to post 28 interviews before August 29th. Status: I’ve published 14 so far, have four or five more almost ready to share, and have a long list of people I still want to approach. I’d like to take a moment to 1) thank you for reading, 2) thank everyone who has participated so far, 3) invite anyone who’d like to participate to please email or leave a comment – don’t be shy!, and 4) present a roundup of the series so far. Click on any name to read the corresponding interview. Hannah, #1: Our biggest Saturn skeptic shares loads of smart advice. Cathy, #4: Wherein my mom breaks the Q&A mold. Aditi, #11: In which I wax poetic about my former yoga instructor. I’m pretty sure the word count of my intro is higher than that of her interview. Russ, #12: Paul Simon enters the picture. Amy, #13: First reflection on 28 by a 29-year-old. Thanks again, team. I’m learning a lot. I hope it’s all right with you that I’m extending my own deadline and committed to publishing at least 14 more of these. Please do leave a comment if you have feedback on the series – I’d love to hear what you think. 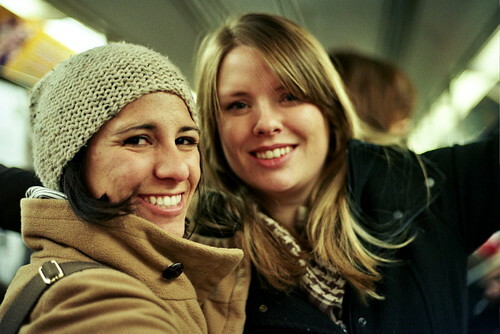 Photo: Leah and Rachel on the NYC subway, 35mm, winter 2011. This entry was posted in Projects and tagged 28 before 29, saturn returns. Bookmark the permalink. Thank you, Claire! So glad you’re enjoying these.